A sandwich so decadent, it was once inappropriate for women to order one. If wandering through Porto’s winding alleyways leaves you starving, or if you’re looking to line your stomach before a heavy night of local wine, there’s only one word you need to look out for: francesinha. The francesinha (“little French woman” or “little Frenchie”) looks like sin, tastes like heaven, and delivers a caloric hit that will keep you fueled for the rest of the day. Served as a gooey, heaped mound in a pool of slightly spicy sauce, the francesinha is a sandwich only by the definition that it contains meat between bread. You definitely won’t be eating it by hand, that’s for sure. 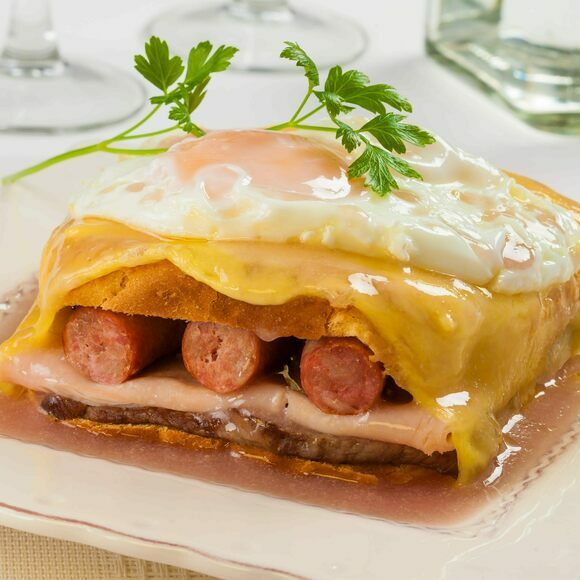 Your typical francesinha contains cured ham, steak, and linguiça (a Portuguese sausage) stashed between thick slices of bread, though other fillings such as turkey or tofu are also used. Coating the sandwich are layers of melted cheese and a secret sauce that contains beer, tomato, chilies, and, apparently, even more meat. If that’s not enough, you can add a runny egg on top and a side of french fries for dipping. The francesinha is not a snack for the faint-hearted. In fact, some residents of Porto (the northern Portuguese city in which the sandwich was born) suggest that you should limit yourself to two meals of francesinha a month, for general health and safety as much as to ration out delight throughout the year. If its origin story holds true, the francesinha is essentially Portugal’s big, beefy answer to the French croque monsieur. Some of the Portuguese refugees who fled to France during António Salazar’s dictatorship returned with a love for melted cheese on their sandwiches. One of these people, Daniel David da Silva, is said to have created the francesinha in honor of the “spicy” French women he had met in his travels. Despite its gut-bursting nature, the francesinha was first considered a snack to be enjoyed around cinemas and bars. It took off quickly among the city’s bachelors, but was considered inappropriate for women until some decades after its birth. Thankfully, anyone is now welcome to partake in the cheesy goodness, as long as you have a few holes in your belt left to spare. You’ll encounter francesinhas in cafeterias, bars, and high-class restaurants all across Portugal, but be sure to head north to Porto and its surrounding cities for the ultimate francesinha experience. And remember: No more than twice a month! An intimate and friendly restaurant close to the Ribeira. They can even make a gluten-free francesinha on request. In the heart of Porto, this cafe offers vegetarian francesinhas loaded with tofu and eggplant. The candy is huge with Norwegian hikers and skiers.